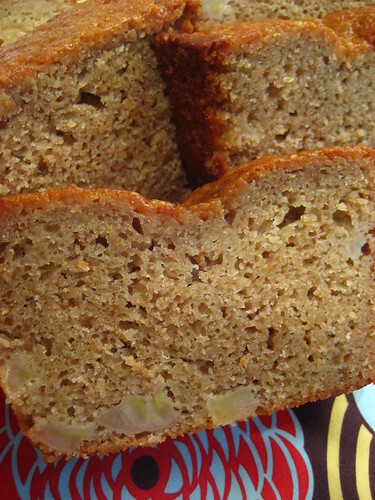 Nothing fills your hungry belly quite like a delicious slice of banana bread hot out of the oven. To me, the more moist and chunkier, the better. Have a warm wedge in the morning with your coffee or after dinner with a scoop of vanilla ice cream. This recipe is so scrumptiously packed with bananas you may just find yourself screeching wildly and swinging from your chandeliers jungle style. Knock yourself out, my little monkey friend. Been there. Depending on the size bananas you use and how much you put in (I actually added a bit more) you may need to increase the baking time. Just insert a knife until it comes clean. Preheat oven to 350 degrees F. Lightly grease a 9x5 inch loaf pan. In a large bowl, combine flour, baking soda and salt. In a separate bowl, cream together butter and brown sugar. Stir in eggs and mashed bananas until well blended. Stir banana mixture into flour mixture; stir just to moisten. Fold in banana chunks. Pour batter into prepared loaf pan. You are so right, there is nothing like fresh hot banana bread. Your recipe looks like it will be nice and moist. This totally reminds me of home. Looks wonderful! Agree. Our recipe has quite a bit of yogurt in it. I'll have to compare with this funky chunky one. Getting the moist factor right is key. Had it this AM! Looking forward to trying your recipe. Nice. I wonder if there's a way to keep the banana chunks from settling to the bottom of the bread. Your banana bread looks so moist! It's the best when it's still warm from the oven. Looks delicious!